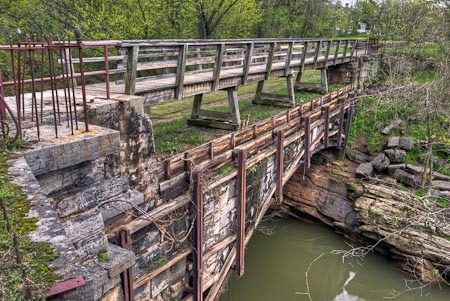 The C&O Canal has fascinated me for many years. At one time I thought I might try to walk the full length of the canal (in small segments) and photograph all of the interesting structures. That is probably well beyond my capability at this point but I am enjoying picking out spots and covering a mile or two at a time. Another outing to the Hancock area was just downstream from Hancock, where I found the Tonoloway Creek aqueduct (mile 123.) It’s pretty well deteriorated and is reinforced with a lot of wood structure. In the background can be seed the Visitors’ Center. Then less than a half mile downstream from the aqueduct are lock 51 (Mile 122.7) and the ruins of a stone lockhouse. ~ by Admin2 on May 13, 2011.